Apple’s iPhone 7 and Google’s Pixel are two of the highest profile smartphones available to the public today, and while the iPhone’s core has remained unchanged throughout the years, the Google Pixel is a new device altogether. There are numerous differences between the iPhone 7 and the Google Pixel, and many features that are ultimately comparable. 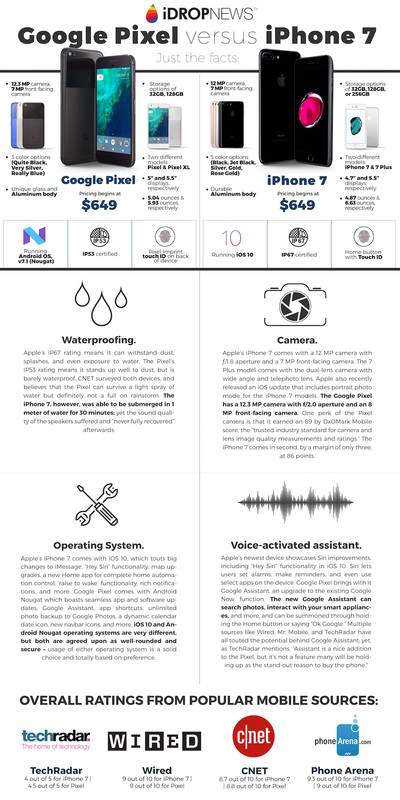 Everything you’ll need to know about Apple’s iPhone 7 and Google’s Pixel will be covered in this guide: including camera quality, battery life, call quality, user friendliness/ease of use, display quality, security features, Siri, Google Assistant, Imprint vs. Touch ID, speaker technology, speed, and even audio quality. So which is better, the iPhone 7 or Google Pixel? Continue reading our ultimate iPhone 7 vs. Google Pixel guide to find out. 4.7” and 5.5” displays, respectively. Apple’s IP67 rating means it can withstand dust, splashes, and even exposure to water. The Pixel’s IP53 rating means it stands up well to dust, but is barely waterproof. CNET surveyed both devices, and believes that the Pixel can survive a light spray of water but definitely not a full on rainstorm. The iPhone 7, however, could be submerged in 1 meter of water for 30 minutes; yet the sound quality of the speakers suffered and “never fully recovered” afterwards. Apple’s iPhone 7 comes with a 12 MP camera with ƒ/1.8 aperture and a 7 MP front-facing camera. The 7 Plus model comes with the dual-lens camera with wide angle and telephoto lens. Apple also recently released an iOS update that includes portrait photo mode for the iPhone 7 models. The Google Pixel has a 12.3 MP camera with f/2.0 aperture and an 8 MP front-facing camera. One perk of the Pixel camera is that it earned an 89 by DxOMark Mobile score, the “trusted industry standard for camera and lens image quality measurements and ratings.” The iPhone 7 comes in second, by a margin of only three, at 86 points. Apple’s iPhone 7 comes preloaded with iOS 10, which touts big changes to iMessage, “Hey Siri” functionality, map upgrades, a new Home app for complete home automation control, ‘raise to wake’ functionality, rich notifications, and more. Google Pixel comes preloaded with Android Nougat, which boasts seamless app and software updates, Google Assistant, unlimited photo backup to Google Photos, a dynamic calendar date icon, new navbar icons, and more. iOS 10 and Android Nougat operating systems are very different, but both are agreed upon as well-rounded and secure – usage of either operating system is a solid choice and totally based on preference.